"The Santa Fe River Park and Trail follows the river almost ten miles from Patrick Smith Park to the new Camino Real Park at the river’s intersection with NM 599. When completed, the trail will be one of three primary urban trail spines along with the Rail Trail and Arroyo Chamisa Trail serving the Santa Fe area. The parkway will provide open space corridors, trails for walking and biking, and a series of parks, as well as a way for bicycle commuters to get to and from downtown safely. Below are listed some the current projects happening along the river. Santa Fe River Park, known as El Parque del Rio, is a linear park that follows the Santa Fe River as it flows through downtown Santa Fe. A major amenity and historic site within the city, the river park was beset with a series of long-term problems. Progressive down-cutting of the river channel has affected the health and viability of many of the old cottonwoods and other trees along the park. Storm water that had for decades helped support the river environment is now piped and fed directly into the river, increasing erosion and contributing roadway pollutants. 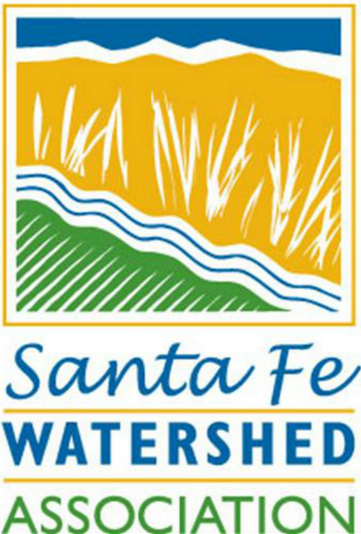 The City of Santa Fe is exploring new ways to handle its storm water runoff and has hired Surrounding Studio to help implement new methods. Surrounding’s team, working with City Public Works staff, has developed a variety of methods for directing storm water to support the river environment, including “oxbow” infiltration structures and pipe conveyance intercepts. A unique idea on the project is modeled on historic agricultural acequias to create “storm water acequias” that take road runoff and intercept and reroute it to linear water-absorbing wicks. Through passive infiltration, these storm water acequias will benefit new orchard trees and native cottonwoods along the river. Other park improvements and irrigation upgrades are being made at Louis Montano Park (near the Boys and Girls Club); West De Vargas Park at Guadalupe Street; and on the north side of the Santa Fe River along Alameda between Galisteo Street and East Palace Avenue. Alto Street meanders along the south side of the Santa Fe River and connects the Santuario on the corner of Guadalupe Street with Ambrosio Street to the west. A walk through the Louis Montano Park across from the Santa Fe Boys and Girls Club and continuing west towards Saint Francis Street on the dirt road along the river will reveal an extraordinary collection of locally-painted murals by Carlos Cervantes and other regional artists depicting the Spanish, Mexican, Aztec, and Indigenous influences in the history and culture of the region. If you live or work in the Guadalupe Barrio and have a story, update, special event, or news to share about our neighborhood or its history...or know of a business or service that needs to be included on this website, please let us know! We are gathering information that might be of interest and would love to include more. ARTISTS and ARTISANS: We are also looking for artists and traditional artisans who work with the image of Guadalupe and can create Guadalupe art installations in our neighborhood and homes. If you or someone you know would like to be added to our upcoming Artists Directory, please send your name, contact info, a brief description of the work you do, AND a link to your website or any online samples. With your permission, we will include you in our upcoming Guadalupe Artists Directory.